Ok, so here’s the riser I created! All set up at work – I sit at an open table. There are supposed to be tiny dividers but they were back ordered and haven’t come. I do, however, have a great doohickey that lets me switch between sitting and standing whenever I’d like, which is really awesome. The existing riser, store bought and standard, leaves my phone pretty low when I’m standing, plus, it was a tiny bit narrow for the laptop. Not problematic, just a tiny little annoyance each day that I don’t need. We have a nice little kitchenette for preparing lunches, with a microwave and toaster oven in addition to the standard office fridge and coffee maker, but I prefer to keep my own little set of dishware, plus the community knife that’s constantly going through the dishwasher is hardly sharp, so more dangerous to use than keeping & using my own – which I wash myself & has a plastic cover. I have a Command hook on the side for my headset, space for my plate & coffee cup, and in the bin at left, my silverware, sharp knife, and cloth napkins. I try to minimize using disposables when there’s a simple non-disposable solution, and it’s hardly any effort to wash a set of silverware and a plate & cup after I eat. There’s also room in there for salt & pepper shakers, although, while one is pepper, the other is Penzey’s adobo, not salt. If you haven’t tried Penzey’s adobo – do; it’s really tasty! Unlike many store brands, it doesn’t have salt, but if you want saltiness too it’s easy to add the amount you like. With staffing changes in the department I work, only Jonathan has a birthday in February, so this was really for him. 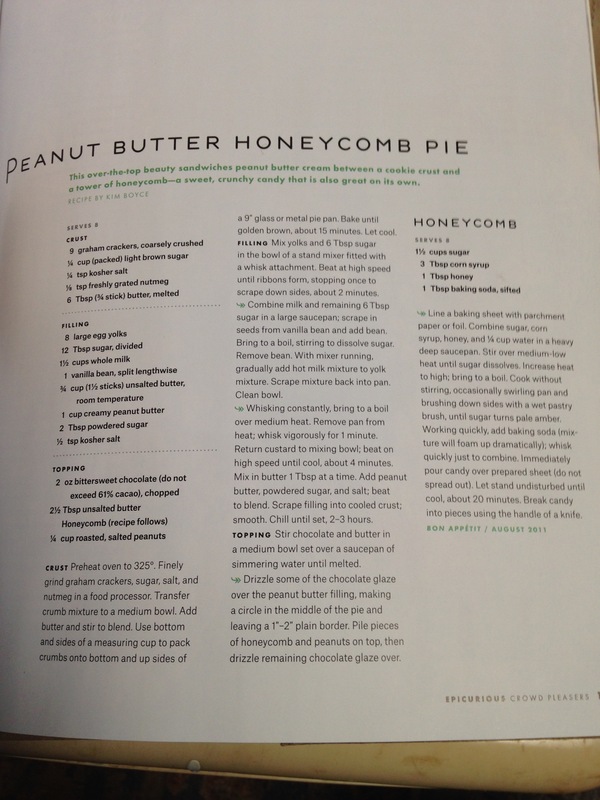 I know he likes peanut butter, and when my sister sent this recipe from Epicurious, I knew I had to try it. 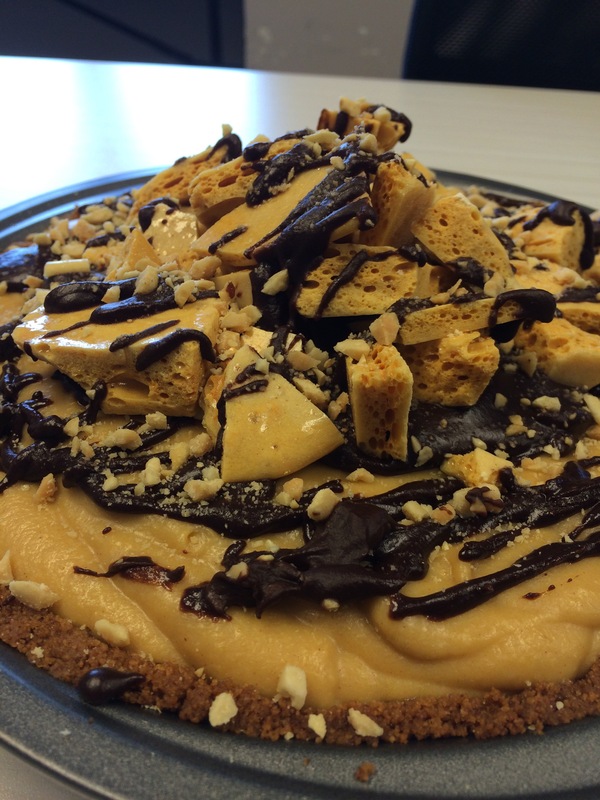 It was fussier than most pies I’ve made (I mean, peanut butter custard?! Cooked on the stovetop and poured in to chill & set up), but in spite of that ended up being really good. I would not recommend cooking it on a weeknight, but it’s a good made-in-advance pie… on the day of its be super easy to just do the toppings fresh. I don’t know how the honeycomb candy would do frozen; it got weepy after a day in the fridge. It’s super easy to make though. I used this amazing honey from Sweet Betsy Farm and it smelled so wonderful while being made, that I might have to make the candy itself on occasion just to take advantage of the yummy honey! All I have for the recipe is a screenshot, but here ya go. In terms of changes, I used twice as much chocolate as specified, and added a splash of cream – the butter-only was seizing up on me in the microwave at work. I also was careful to temper the eggs, a point not mentioned in the instructions, and I passed the custard through a seive before returning it to the mixing bowl. The seiving might not have been totally needed, but I ended up with a perfectly smooth texture so I decided it was worth the time. Short & sweet: kicking it in gear this year… thank you, Sean from Craigslist. Slightly rusty, like me, LOL; hopefully we both fix up well. So why wouldn’t I want to look at something beautiful during that time? It’s going to be a new telephone riser. My office gave me one of those black metal ones to use, but it was just slightly narrower than my laptop, which went under, that it was a small annoyance each day. (Was able to give it to someone else who wanted one, so no waste.) I also have a desk doohickey that allows me to sit or stand, so I wanted one that was a bit taller than the normal 4″ or so. I’ve trimmed the backboard so the bottom section is open (computer dock and cords will be going in there), and won’t be using the bottom shelf and one vertical divider. To keep the backboard up, instead of following the force of gravity, I filled in the grooves below it. I’ve also filled in some of the other grooves; those won’t be used and since the inside of the grooves is dark brown MDF color, they were a visual distraction. Here I used caulk, but it shrank and cracked in a very ugly way, so I later filled right over with drywall compound. I’m pretty much at figuring out where I can use an aerosol spray sealer in my house (um, it’s 19° and -1° windchill right now – not going outside).